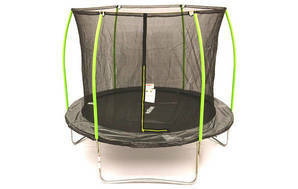 Snapshot: The Playsafe Springless is a 10 ft springless trampoline. But how safe and easy to use is it? Easy to enter and exit through the zipped opening. Difficult to assemble: the elastic spring-bands are very hard to install, requiring 2 people. Available in 8 ft, 10 ft and 12 ft models.